As promised, Wild Banshee is continuing to celebrate the Olympics by bringing you recipes with an international flair. Today's recipe is in honor of the host country, Great Britain. 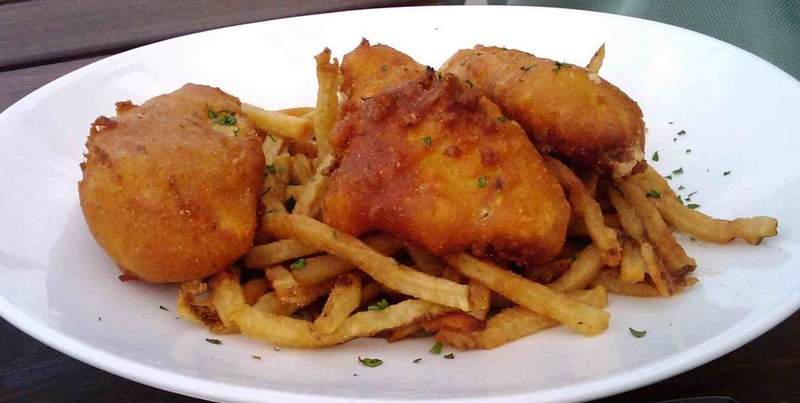 Beer Battered Fish and Chips. In this recipe, we are going to cheat a little bit on the "chips." I know that fresh cut fries are better than frozen fries. But the big taste difference comes when you use a fryer instead of baking them. These will be frozen fries done in the fryer. Preheat your oven to 225 degrees. Line a baking dish with paper towels. Heat up the oil for frying, and fry according to the directions on the package. As each batch gets finished, put into baking dish and season with salt and pepper while hot. Place finished fries in the oven to keep them warm until the fish is done and ready to serve. 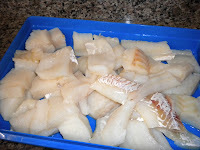 Cut the cod into appropriately sized pieces. You know what it should look like. Make sure that your pieces are similar in thickness. Line another baking dish with paper towels. In a bowl, mix together flour, baking powder, salt, cayenne pepper and Old Bay. 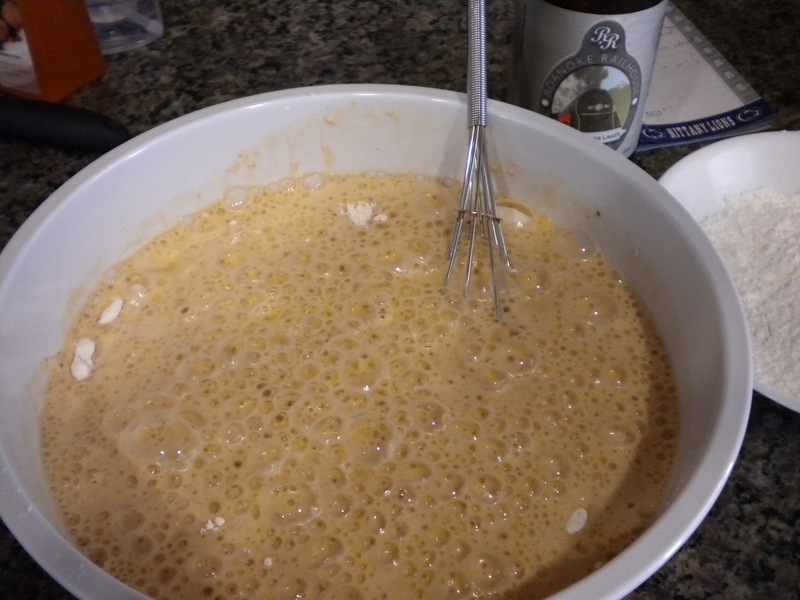 Add the beer and whisk until batter is smooth and has no lumps. Refrigerate batter for at least 15 minutes. It can stay in the refrigerator for up to an hour. 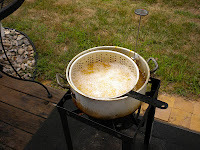 Heat frying oil to 350 degrees. Dredge fish pieces in cornstarch. Dip into batter and coat completely. Place immediately into the hot oil. Do just a couple pieces at a time. Fry for about 8 minutes. Flip half way through. When the fish is done, put it into the baking dish. Season with salt and pepper while it's hot. Put the finished fish in the oven with your fries. Repeat until all the fish is cooked. Frying can certainly be done in the house on the stove. But, it is a messy proposition and makes your whole house smell like a fast food restaurant. I do this outside in a fryer designed for this purpose. It has a propane tank, and it's more shallow than a turkey fryer. Don't get the oil too hot when you are frying the fish. If the oil is too hot, it will burn the batter before the fish is cooked through. You might want to do a trial run to practice. It's hard to get the first batch just right.